Abaco Hosting Review 2019: Is Abaco Hosting a Good Hosting? Abaco offers shared and reseller hosting packages throughout North and South America, as well as Europe. The company also offers dedicated servers for more enterprise-grade hosting. 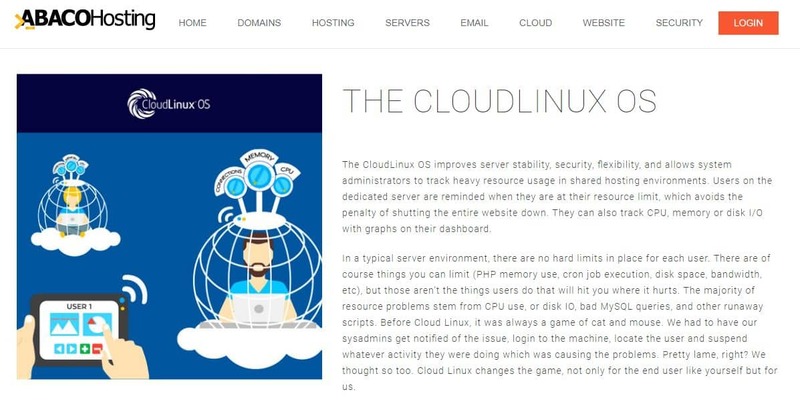 All hosting plans come with cPanel, CloudLinux OS, and Softaculous. Abaco also uses a Cloudflare Content Delivery Network to guarantee fast speeds. Abaco has been in the web hosting scene since 2007. Originally launched in Venezuela, they’ve since expanded their services to North America and Europe. Their core offerings are their shared and reseller hosting packages, though they do have dedicated servers available should their customers require enterprise-grade hosting. Their data centers are located in London, Istanbul, Texas, and Hong Kong. From their packages, it’s clear that Abaco caters primarily to professionals, small to medium-sized businesses, and bloggers. Their shared hosting packages are split into one-domain and multi-domain plans depending on your needs; if you’re a professional or startup, their one-domain shared hosting plans should be more than sufficient to meet your needs. Abaco employs the familiar cPanel on their shared hosting packages and the highly popular CloudLinux OS, which affords their web hosts better control over resource usage. This ensures optimal performance and ease of use. Hosting plans also come with the popular app installer Softaculous, which enables one-click installation of over 300 scripts. Plus, they also employ a Cloudflare Content Delivery Network (CDN) to ensure lightning fast speeds, and they’ve got you covered on the SEO front with their included Attracta SEO tools. Businesses requiring more high-powered servers can also opt for one of their Linux KVM VPS hosting plans, which serve as a bridge between shared hosting and dedicated servers. If you’re wondering when to upgrade to a VPS hosting plan from shared hosting, Abaco seems to have invested a bit of effort into educating their customer base: they have a few handy articles tackling questions in that area. On the other end of the spectrum, beginners would be well-served with one of their combo plans, which come packaged with hosting, email, and the use of their website builder. Abaco’s shared hosting plans are extremely affordable – in fact, the quality they offer for the fees they’re charging is amongst the most competitive in the market. Abaco does not offer a free plan, but they do have a 30-day money-back guarantee. One downside is that it may not be easy to switch plans with Abaco, given that the rates advertised are on a yearly basis. You’ll have to get in touch with their technical team, and they’ll walk you through the process. Abaco also accepts digital currency payments such as Bitcoin, Litecoin, Digibyte, and Monero. Customer support is available via live chat, email, and a support ticket system. Response times for submitted tickets were decent enough. Unfortunately, their live chat was offline the few times I tried accessing it. There also does not seem to be any phone support available. Abaco is competitively priced for what they offer – in fact, they’re one of the most affordable in the shared hosting arena. Since they also handle domain registration, site security, and email hosting, they’re a decent one-stop internet services hub for professionals, bloggers, and small to medium-sized businesses. Wondering how Abaco Hosting stacks up against other Web Hosting companies? Enter any other Web Hosting company and we will give you a side-by-side comparison.